Rich in healthy medium-chain-triglycerides (MCTs), which metabolise into energy. Coconut oil’s fatty acids have antifungal, antibacterial, antiviral properties to support the immune system. Coconut oil can also kill harmful pathogens in the digestive tract. 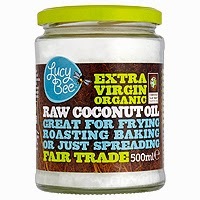 Not just for cooking, it’s wonderfully nourishing for skin and hair when used as a natural beauty product. Studies suggest coconut oil reduces abdominal obesity and helps you burn more calories.